This school year I wanted to grow in my field of educating children, so I applied and joined the Innovation in Teaching Fellowship. This personalized learning fellowship is a free cohort program offer to Dallas ISD teachers. If you teach in DISD and are eager to innovate and develop a data driven classroom, this is the group for you. If you are like me, you are always looking for ways to improve your teaching, and not just through required professional development, but in ways that genuinely interest you. The Innovation in Teaching Fellowship checked that box for me. After my first couple years in the classroom I felt that I had accomplished a lot, but there were still pieces of the puzzle missing and I needed a jumpstart. When the fellowship began last summer, we immediately dove into a “design sprint” which pushed us to reconsider our approach to planning, thinking, and learning, not only in our classroom but in our everyday lives. On top of that, I was also able to attend an SMU class that helped improve my implementation of blended learning in the classroom. I have since been thrilled to use these innovative processes with my students as a means of developing critical thinking and problem-solving skills. I specifically applied this new thinking as I taught my students about useful light sources. Instead of taking a direct instruction approach, students used components of the design thinking process to design and build their own source of light. Student were presented with a problem (i.e. being stranded somewhere with no light), and challenged to design an object that would help them see. As a teacher it was exhilarating to see students so engaged and eager to share thoughts and ideas with their classmates and others. Ultimately, the Innovation in Teaching Fellowship is much like The Educator Collective - a group of educators coming together who are eager to learn and improve their skillset. We meet in fun places and exchange ideas with a nonjudgmental attitude. I would commend the fellowship to any Dallas ISD educator who might be interested. “What has segregation cost us?” I could write every data point; but we can look across the country at our current state and in any major city see what segregation has and is doing today. It is costing us relationships. It is costing us neighborhood development. It is costing us, most importantly, trust. If you google “definitions of segregation”, you will find 7.8 million results. To set the stage, it is literally defined as “the action or state of setting someone or something apart from other people or things.” I cannot read that definition and it not crawl through my skin. It bothers me. It feels wrong. It feels divisive. But – it is absolutely our reality both in Dallas and across the country. 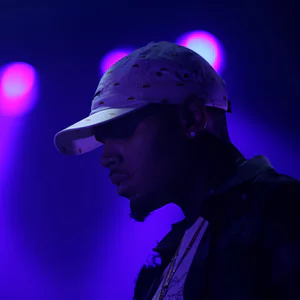 "Segregation cost me exposure. I lived five minutes from downtown but never really had the chance of seeing it growing up. There was public transportation to connect us; but we never really felt connected. Segregation caused me to limit my dreams. Rarely did I ever see African Americans in high powered positions; I only saw them sweeping the floors of my school or serving my food through a fast food window. This caused me to believe that the ‘American Dream’ was not feasible for people who looked like me. Segregation cost me opportunities. In schools with surrounding impoverished communities, opportunities came once in a blue moon. There were not a lot of people to come and invest in us. This has caused generational curses of broken dreams and hopelessness. Students often saw themselves as a nonentity and their aspirations reflected such." But where do we go from here? How do we, as leaders in the classroom, cities and country truly move past a reality of segregation into a place of unity and productivity? RELATIONSHIPS | Rooted in history, Biblically, we have been taught to “Love our neighbors”. Over the last several years, I have spent more and more time truly understanding what that means and the impact that is had when you treat communities you are trying to serve, as neighbors rather than a group of people who “need” you. True community development, regardless of your profession, is identifying what it means to be a good neighbor and living it out in every way. Additionally, we must start looking at our youth as our next generation, from within the communities they are raised. Leaders must be raised up from within. From early on, instilling in children the value and power of their community. Author John Perkins states, “Those who stay behind are the glue that holds together and help rebuild”. NEIGHBORHOOD DEVELOPMENT | Go to the people. Learn from them. Build with what they already have. Love them well. And empower them with the resources you have been given. We must remove the notion that driving through a community, looking from our safe protected car, grants us the opportunity to be the Savior, but rather a resource for hope, willing to work alongside them. Last year, a nonprofit I was working with was given a sizable grant to try and deploy a two-generation approach to a community in Southern Dallas. In short, offering programming to the students through their school and adults through programming. One of the women raised her hand and said, “in all due respect, this is not the first time we have been asked to do a program tied to some grant.” She went on to say, “why don’t you spend that money creating a book of our stories of survivorship, stuck in generational poverty?” To date, there has not been more impactful words spoken to me. Imagine that, a community, who is known on a map for being poor and left behind, wanting to share their stories to empower other communities and generations behind them, to think and know their strength despite circumstances. TRUST | I am a white woman. Being a young, white woman in the city of Dallas is no short feat. On one side it’s a white man’s world and on the other side it’s a prominently black and brown world whose wounds build barriers to avoid letting any white in. Why should they? So many have come before me. Come with all the answers and all the promises in the world. And often, delivering nothing but broken promises or opportunities for anyone but those who actually live in the community. Then I met Ms. Mrytl. As always, I went around the room and I shook hands and introduced myself. I came to Ms. Myrtl and she didn’t want a thing to do this me. Nothing. Did not speak to me. I extended my hand. Nothing. I said “well my name is Christie. Nice to meet you”. Oh, it bothered me so much. Months later I tricked her into meeting with me. Literally. Through a friend. We sat and talked. She raised her voice. I raised mine. She stopped and said, ‘well damn Christie - you aren’t kidding”. I said, I know I have been trying to tell you that. Months later, she became my biggest cheerleader. Every project. Every meeting. That woman sat next to me and proudly promoted all that I was trying to bring to southern Dallas. She believed me. She TRUSTED me. You are likely wondering why I am speaking in past tense as if I must have lost her trust. But that sweet woman passed away suddenly February 23, 2018. When her funeral was being arranged her daughter called and said “Christie. I’ve seen my mom with you.” She went on to ask if I would speak at her funeral, to which I said “absolutely.” I stood amongst 22 others, the only white speaker because Ms. Myrtl and I built a relationship, rooted in trust for one another. They are three words we use and teach about regularly. They are the pillars of how we believe children should be taught and raised. I challenge each that reads this, that we must begin to truly look inside and reflect how we, the adults, are prioritizing these three things to eliminate the segregation that exists in our communities, cities and country and how we, collectively, are working to love, serve and empower those around us. The days can go by so slow, but the school years fly by! Can you believe we are passing through January already? As I sit here across from my three-year-old daughter, trying to readjust my seat six months pregnant, we are practicing for the millionth time how to write her name. If you are like me, your entire life revolves around serving people, sometimes without even realizing we are serving. As educators we are natural public servants...we can’t help but constantly proof-read people’s social media posts or calculate the tip percentage at happy hour mentally while our friends turn to their tip app on their smartphone. With our brains and our bodies always on the move, it gets exhausting. Not to mention the toll of our actual jobs of educating the youth of society to read, write, calculate, comprehend, engage, critically think, and become independent young adults in 45 minutes to turn it around for second period (regardless that 1st period totally bombed that quiz where you basically gave them the answers.) The moral of my story… we MUST take care of ourselves. We are expert jugglers who balance home life to a professional life to a social life but while we teach and preach self-care to our colleagues and our students, can we say it to ourselves in the mirror? Fitness and nutrition have been a part of my life since I was young; I literally grew up in a gym, but trust me when I say I have absolutely had the lunch consisting of three-day old tortilla chips and a warm Diet Coke from that useless, busted machine in the teacher’s lounge. I, like many of you, tutor before school, during my lunch block, after school and lesson plan during my planning so the idea of exercise or following a nutrition plan used to be a joke to me. It’s common for us to eat walking down the hallway to our next class or next mandatory meeting. But I decided three years ago after having my daughter that my body deserved better. My body gets me up, walks me from A to B to C to D etc… and I treat it with poison; literally food that is banned in other countries. Shame on me. So, I came up with a plan in 2016; For one month I would eat foods without labels, I would prepare them, and I would commit to moving my body more than my average 10,000 teaching steps a day. Within the first 10 days I noticed a difference in how I felt, and it immediately affected my profession; My patience was not as thin, and I was more committed to my students. I felt a sense of perseverance, so I expected it of them as well. I raised the bar for my babies because I felt better. That year my passing percentage went from 83% to 88% in math with two sections of bilingual students, one dual language, and one general education. I never looked back after those 30 days of my nutrition experiment. I still eat on the go, but I eat whole foods from the Earth verses from a chemical plant or bag. I get it, I didn’t think I could either. You know what else I didn’t think I could ever do? Maintain a healthy marriage through graduate school, keep my family in one piece while bringing home the hardships my students face daily, plan my dad’s funeral while also planning my wedding, teach math through being on medical bedrest in my pregnancy, and the list goes on. Somehow when I look back, eating some quinoa, beans, fresh veggies, with homemade peanut hot chili sauce didn’t seem so bad. Trust me when I say your pallet will change and you will quickly break the nasty habit of consuming over processed foods and drinks, developing a love for the beauty of flavors the world has provided us with. So, for going on three years I have been running from our planning meetings to my lunch tutoring club eating fruit out of a Tupperware then stuffing my face with a veggie burrito going to carpool, all while downing 80 oz of water throughout my day and I can honestly say to you I have never felt better. I do not think I could do what I do everyday without the diet I have grown a custom to. At the end of the day, YOU are the most important person; your students get the reflection of how you feel… no matter how well you try and mask it. I challenge you moving into 2019 to change the way you look at food. Food was and is designed to fuel us, keep us alive, keep our energy up, and this doesn’t mean you have to throw away flavor, happiness, and satisfaction. I have attached a free meal plan below developed by myself and my husband (sport’s nutritionist/chemist) that is SIMPLE to prepare, CHEAP, and EASY to eat. Happy 2019 to all you beautiful educators! Bun-it-up with the onion and garlic, add lettuce, tomato, mustard, whatever! Have you ever had days when cellphones are just a huge distraction and it seems impossible for your students to get any work done? Students are constantly hiding their cellphones, and it seems like every time you turn around someone is distracted. It’s hard to micromanage, to give warnings, and to confiscate cell phones when you have about 50 minutes to teach your lesson. Well, I don’t know about you, but I have a few of those days and I also have 3 tips to make cell phones work for you in your classroom. I once had a math teacher who told me, “You have to memorize this because one day you won’t have a calculator everywhere you go”. Well, in today’s society I actually have my smartphone, which doubles as a calculator and many other things, in my pocket everywhere I go. Our world is constantly changing, and we must learn to adapt to become better teachers. Therefore, having the right mindset is the key to changing your viewpoint on new technology. Since we are living in the information age, there will always be new gadgets and gizmos everywhere you turn. Instead of fighting it, you should learn to embrace it. You should think of cellphones as a new resource that students are bringing with them to school and almost every child in your class will have one. For the students who don’t, I always have an extra device for them to use. With the right mindset, you will find endless reasons to use cellphones in your class. There are so many apps out there that you can use to enhance your teaching. However, do not get overwhelmed with these apps. Only use the ones that you feel comfortable with otherwise these apps become more of a distraction than a help. It is nearly impossible to keep up with all the new apps and that is why you should stick with what you know how to use and learn what you want to. There are some apps that I use, and I will talk more about them in tip #3 below. By making cellphones your ally and not your enemy, they will start working for you and help you to become better teachers. I have two systems in place for all the cellphones. The first system is a charging station where I purchased a wall door hanging cell phone holder for 35 phones, a USB fast port charger for 20 chargers, and an extension cord for students to plug their phones in. The charging station is on a first-come, first-serve basis and they have the beginning of class to plug in their phones. They can only take their phones out at the end of class. Two ways how this is helpful is firstly, their phones are away and are no longer a distraction when you are teaching. And secondly, their phones will be charged for when it’s time to use it for your class. The second system I have is simply a basket in which all their cell phones go on testing days and days where I do not want them to use their phones at all. When they see the basket, they must put their phones in there and they cannot charge it. This is my first year teaching Statistics and I have had the joy of creating lessons for this new program at my school. As I was creating my lessons, I wanted them to be engaging and relatable to my student’s lives. Luckily, statistics is a more applicable math course and I had such a great time planning for this course. Students in my math classes often ask me the question, “When will I use this?” and in my statistics class I usually respond, “Every day”. Project-based learning is the idea that you give students the opportunity to deepen their base knowledge through the active exploration of real-world challenges and problems. This does not mean that the students are learning the foundations by themselves, you are still responsible for teaching the basic foundations of the topic that the project is based on. By using a project, the students will become experts on that topic and they will internalize their learning to be able to apply their knowledge cross-curriculum. How did I start project-based learning? I started all my project-based learning by asking myself this question, “How can my students use their cellphones to deepen their understanding of what I just taught them”? For example, for the first unit on characterizing variables, I had my students listen to a local podcast “Second Date Update” and determine whether the success rate was based on categorical or quantitative variables. For my second unit on analyzing statistics using different methods, my students researched two famous or infamous people and compared their stats to determine the better person based on their own criteria. For my unit on Normal Distribution, I told my students to go online-shopping at their favorite store and to analyze the prices at their store to determine what is normal and what is not. I also used my favorite app, Zillow, to have students look at real estate and analyze the area that they wanted to live in and create a normal distribution curve. I am only using apps that I use on a regular basis, and by doing so I’m sharing my knowledge with my students. Is project-based planning easy to do? Planning for project-based learning is a lot of work and it requires a lot of planning ahead of time. However, if you have the right mindset from the start, it will work for you. With every project that I give my students, I have a daily benchmark, so my students know what is expected of them. I let my students be in charge of their own learning, but I also provide students with guidance when they need it. When my students are researching on their cellphones and working hard, I can see that they are engaged and learning. I don’t have to worry about policing cell phone usage because they are researching information that they are excited about. The best part about project-based learning is being able to talk to your students and getting to know what they are interested in and what they are excited to learn. I also found out that when students are held to high expectations, they will meet it because they know that you care. In summary, I hope these three tips help make cell phones work for you. I truly believe when your students oversee their own learning, they take pride in their work. They are excited to share what they have learned with you and with their peers. They internalize what they have learned, and they are able to teach others. My students always reference a topic that they have learned through the project that they had to produce. It brightens my day when my students tell me, “I finally understood the topic because we did this project” or “I had so much fun listening to that podcast”. I am proud to say that cellphones are a great resource in my classroom and I wouldn’t have it any other way. It’s only November and you’re probably already trying to figure out if it is humanly possible to meet all the deadlines and where the next happy hour will be. Trust me, I understand! Although I cannot write those lesson plans for you, I would love to help by equipping you with some technology that will make your journey as an educator run a little smoother! I believe it’s important that we as educators stay abreast to technology as it has the potential to increase our efficiency and provides unique avenues to connect with our scholars in the classroom. Here are three apps I feel could enhance your practice and lesson plan delivery. And for extra credit, they are all free! 1. Talking Points - Dallas ISD’s current student demographic is currently 70% Hispanic, 22% Black/African American, 5% White and 1.5% Asian. Depending on which part of Dallas you teach, there’s likely even more diversity. Diversity is beautiful, but it can lend itself to communication gaps. Thus, keeping our scholars’ families out the loop in regard to their child’s education. The Talking Points app is a great resource for bridging this gap and communicating effectively with families of all backgrounds. 2. Padlet – If you’re a secondary teacher like myself, then you know our students will have phones. (In fact, we are even seeing students at the primary level with cell phones now!) A phone is practically glued to their hands, so why not implement them in your practice? Padlet is a cool website where you can create a digital “parking lot” for students. My favorite part about Padlet is it amps up classroom discussion and gives equity of voice to all students. • Students can respond to a posted question, quote, or anything you can imagine. 3. Quizizz – With this app, the classic “pop quiz” has received a technological makeover! Quizizz is an awesome application that gamifies the education process without diluting the content. The best part about Quizizz is, you can do quiz students without piles of paper and it practically generates grades for you. Students will not need to make an account – all they need is a game code. I hope the remainder of your school year proves to be one of the best years yet for you and your students! Take some time to check out these apps before the end of 2018 and let the Educator Collective know how it went! Torrian in an 8th Grade Science and Physics teacher at Billy Earl Dade Middle School, in her 5th year as an educator. I talk regularly with my colleagues about our role as teachers in civic duty or political engagement. There’s fear that teachers are not professional enough to handle the responsibility of engaging these topics in the classroom without personal bias or systemic indoctrination. I’m inclined to agree. I see it as our responsibility to develop our students towards stronger critical thinking. And what that means practically depends on the culture of your student body and community. And then to challenge those starting point beliefs. To develop critical thinking means to move students away from the acceptance of dogma as truth and towards participation in beliefs through commitment. The result is that students who leave discussion in opposition or in agreement will be more capable of living those beliefs. They aren’t just words spouted in response to situations, learned from parents and peers and role models; they are convictions that motivate actions consistent with the beliefs. And thus, the role of teacher is to be interlocutor regardless of personal position. It does our students—and our society—no benefit to transition them from believing in one dogma to believing in another. This is a tall task for passionate teachers. Those who have the boldness to be interested in engaging these topics are likely to believe strongly in their convictions. Trusting it is ok for students to think differently than that may feel like a loss in the classroom. What's a teacher to do? A little separation from the present can give the opportunity to learn context for students, as well as see how our ideas change or return over time. If students want to discuss politics of the present about #MeToo or Trump, then I would take them to the 70s: Women's Liberation or Reagan's defeat of Carter. These conversations will still be passionate, but they can help with practice with the benefit of perspective. I read a wonderful essay about the different roles Socrates played as teacher in Plato's writings. While all of them could be useful, one that seems particularly appropriate to this task is the analogy to a midwife. The midwife does not give birth, but has great skill in assisting the mother to do so. Similarly, the questioner may not know what the answer to a question is, nor are they looking for it from their own mind—they are skilled at drawing out the ideas of the student. Identify what goal is sought in discussion and allow that to be the focus; thus it will rarely be that students need to think a certain opinion or know what the teacher thinks for the goal to be accomplished. The primary activity of the teacher in this role is as listener. It takes especially good listening to ask appropriate questions which lead students to question their own claims and justifications. Not because we wish for them to arrive at a certain idea—we want them to have this ability as they continue to think through ideas individually in their lives as citizens. There’s a trade off for relationship development. Knowledge of one another is important for developing human relationships, so too much distance can cut against many of the goals in the classroom. As teachers, we need to be skilled questioners and listeners to draw out what our students know and think; we also need to share some of who we are so relationships can exist—each without ruining the other. This is an interesting balance I’m still trying to figure out. Congrats! You survived the first few weeks of school! If you’re like me, you prepared for weeks with many restless nights wondering if everything was perfect and ready for your new group of scholars. Doesn’t it feel great to start a new year with a clean slate of kiddos and minimal desk clutter? Now, you can execute all the new ideas and strategies you learned from your summer PDs, roll out those new lessons you read about, and finally carry out your plans to eat healthy and workout!...or at least that’s the plan! Much like New Years Resolutions, we all start the school year off with lofty goals and a plethora of new duties. If you haven’t by now, you will soon feel overwhelmed with the demands of our calling as a teacher. Many times, because we love what we do, we allow ourselves to take on too much, overcommit, or get carried away with responsibilities, only to get burnt out by October. To keep this from happening, don’t forget to keep YOURSELF healthy. Refrain from allowing yourself to feel like you’re drowning in lesson plans, grading, and curriculum building. In order for us to be the “superhero teacher” our kiddos, parents, and colleagues need, we HAVE to take care of ourselves. As educators, we have bought into the lie that this makes us “selfish,” when in reality, taking care of you is the only way we will have the stamina to care for your students all year long. You’ll inevitably have worries for your kiddos that you’ll take home with you, but don’t let these overtake you where your own personal needs become completely neglected. Schedule a mani-pedi, go on a dinner date, or make time to catch up with colleagues or old friends. It’s crucial for us to realize the most important tool for a student’s education is a healthy and happy teacher. This means when you finally have some down time, even during a school day, allow yourself to a moment to breathe. Take a stroll down the hall and check up on the first-year teacher, send a little wave and wink to the veteran. Don’t feel guilty to have lunch with your team and NOT talk about school. Build one another up and get to know one another on a personal level. Our kiddos will get taken care of. There are many like-minded adults on your campus with the same goal of loving and caring for students... but the question is, who is going to take care of YOU? This year, keep in mind the best way to help our scholars is to practice self-care. I wish you all a healthy year, filled with laughter, the joy of seeing your students’ “aha moments” and those “can you believe that just happened?” stories that make it all worth it! TEC hosted its first Summer Social of 2018 at The Grove at Harwood in Uptown on Friday, June 22nd. Around 40 educators from 15 different schools braved the summer heat and came together for an evening of outdoor games and a well deserved evening of relaxation. TJ Rusk Middle School, Thomas Jefferson High School and Uplift Triumph were among the schools represented as coworkers and friends were able to catch up after their first few weeks of summer break. It was also exciting to see the TEC community continue to grow as our first educators from Carrollton-Farmers Branch ISD and Frisco ISD joined us at The Grove. TEC’s social events serve as a great space to make connections with fellow teachers from across the metroplex and continue to grow your professional network. Whether you’re searching for a new job, wanting to discuss best practices, or simply looking for a place to unwind with friends and fellow teachers, we have you covered. We always want TEC to be a community that that you can depend on for resources and relationships as you grow in your careers as professional educators. 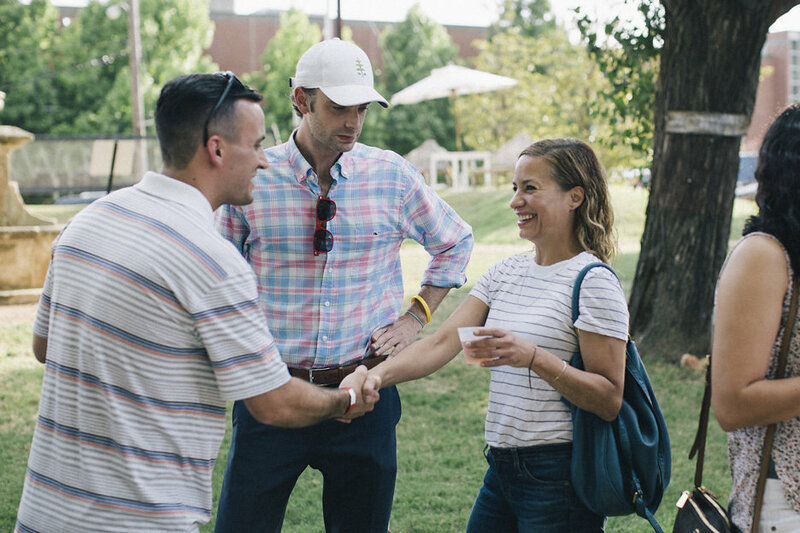 To that end, don’t forget to join us for our next Summer Social at Deep Ellum Brewing Co. on July 26th. We’ll have guided tours of the brewery, local craft beers on tap, and a happy hour in the taproom to close out the evening. You won’t want to miss it! The Educator Collective Advisory Board is a council of educators that serves an integral leadership role within TEC. Members of the advisory board work with TEC staff to build programming, lead initiatives, and serve as the face of the organization on school campuses. The work of the advisory board in indispensable as the TEC community continues to grow and strengthen. To that end, we are thrilled to add three capable and passionate teacher-leaders to the advisory board this summer. We started the advisory board at the beginning of 2018, and, with the addition of Reanna, Jordan, and Paige now have seven committed board members (check out the “Our Team” page for a full list of board members). Our vision is to add 3-4 more educators to the advisory board in the upcoming school year. If you are interested in this unique leadership opportunity, please do not hesitate to contact us. 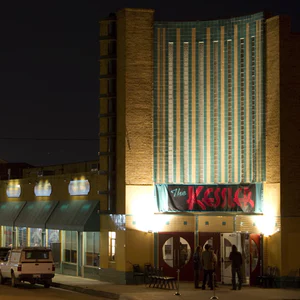 FOR OAK CLIFF'S "DAY AT THE MOVIES"
Five Great Ideas for Traveling Teachers! We are down to those final school days. 19 to be exact, not that we’re counting or anything. The last few before those glorious words “summer break” are a reality and days that aren’t chock full of instructing, grading, lesson planning, pencil sharpening, test writing, hall monitoring, lunch duty-ing (and so on) are the norm, for a couple of months at least. As an educator, vacations can seem daunting because it’s just one more thing to plan, one more thing that costs precious dollars, one more thing that must, of course, come to an end. But, also as an educator, vacations, self-care, a chance to unplug are so deserved and needed. So let’s find a way to make this more attainable and realistic, shall we? Not all vacations mean traveling to the ends of the earth, spending oodles of dollars, or getting stressed over planning the details. Below are five travel ideas that I would consider doable, plannable, and bookable for an educator yet also exciting, somewhat exotic and definitely worth showcasing on social media (if it isn’t on Instagram, did it even happen?). Not only is Marfa one of the most Instagrammable places ever, it exists in our very own great state and is totally drivable! No, I-20 isn’t the most scenic going through the western part of Texas, but once you arrive in the charming village of Marfa, all thoughts of tumbleweeds and oil rigs will be a distant memory. Art, shopping, delicious meals and easy access to Big Bend National Park set this little desert town apart as an oasis worth visiting. If New Yorkers are coming down to experience it, you know it has to be something, right? Not to mention the variety boutique hotels - Hotel Saint George, Hotel Paisano, Thunderbird Hotel, or if you really save those pennies, El Cosmico - to name a few. And, of course, who wouldn’t want to catch those eerie Marfa Lights?! Sunshine, beach, colonial town and no need for a passport? Sign me up! Puerto Rico, despite the tragedy from Hurricane Maria, has recovered so nicely and is anxious for visitors, allowing for a very affordable beach vacay. Old San Juan, the oldest settlement on the island, is home to a ton of history, fabulous restaurants and super quaint lodging. All of this coupled with some really great beaches (Isla Verde, Dorado, Rio Grande) make for a wonderful getaway that doesn’t take hours or lots of $$$ to get to from Dallas. Some of my favorites for boutique lodging include El Convento (think old world charm meets contemporary elegance), Olive Boutique Hotel (definitely ideal for a romantic stay! ), La Terraza de San Juan (happy hour on that rooftop terrace is a must), and The Gallery Inn (the ultimate bed & breakfast experience). There’s also quite the bar and casino scene, if that piques your interest! Summer time in Oregon, Washington and western Canada is tough to beat, especially when we are constantly waging war against the heat here in Texas. Cooler temps, gorgeous scenery, hiking, wine tasting, whale watching and just a general sense of the outdoors? How could anything be better?! With direct flights on a variety of airlines to Portland, Seattle and Vancouver, the PNW proves to be a perfect escape from the triple digits and insane A/C bills. Pick one and do a long weekend, or pick all three and turn it into a road trip marked by national park after national park, one insanely good cup of coffee after another, and a stamp on that passport upon entering Canada. Airbnbs and super cool boutique hotels (i.e. The Society Hotel in Portland, Hotel Five in Seattle, The Burrard in Vancouver) are not hard to come by in any of these spots, and neither is delicious food (Portland - Pine State Biscuits and Pok Pok, Seattle - Spinasse and Matt’s in the Market, Vancouver - Uva and Rodney’s Oyster House) and a variety of activities. Breakfast in PDX, morning photo op at Cannon Beach, an afternoon hike in Rainier National Park, and an evening spent at Pike Place Market equals the perfect PNW day in my book! 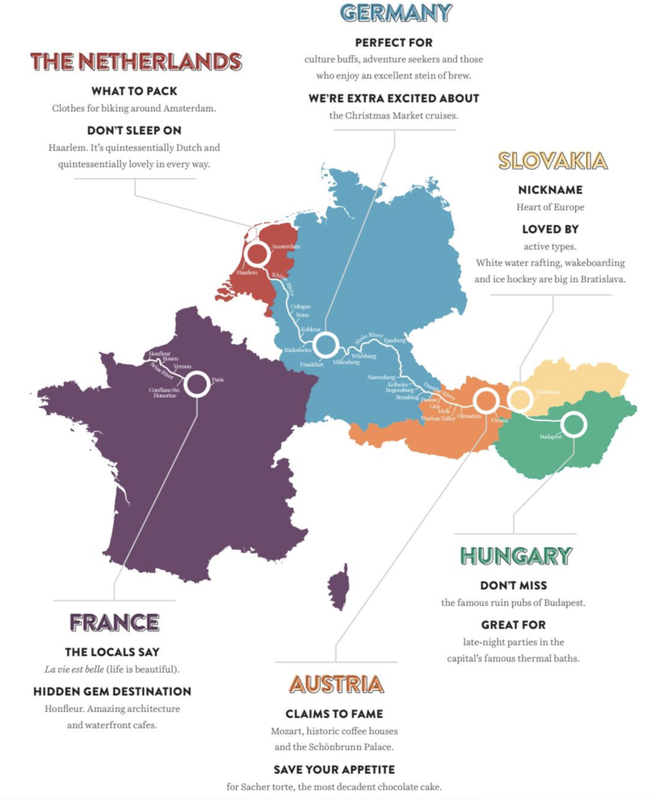 The mission statement of Contiki is to plan travel for the “young, wild and free” (AKA those who are between 18 and 35 years old) to places all over the world and within a moderate budget. The idea here is to bring people from a variety of backgrounds and homes together and introduce them to new places, new cultures, new ideas. Their philosophy is to change perspectives and open eyes to see what is out there and to do it with some new friends - and I LOVE this philosophy! They plan the nitty gritty of over 300 trips to six different continents all throughout the year, yet you get to make many of the decisions (transportation, activities, lodging, how you spend your time, etc.). Being able to filter trips by destination, length, cost, etc., there is something out there for everyone. The world is truly your oyster with Contiki! When you first hear the words “river cruise”, your mind probably automatically says “no thanks, that’s for people my parents’ age”. And that isn’t completely inaccurate. However, Uniworld, one of the leading river cruise companies, decided it was time to tap into the millennial generation and get us cruising in a way that still kept us feeling young and adventurous. Enter: U by Uniworld. Originally designed as river cruises for 21 to 45 year olds, U by Uniworld is the perfect way to experience some of the greatest gems of Europe with an all-inclusive part hotel/part yacht homebase. They max out at 120 guests per cruise, which offers a unique and intimate experience. Not to mention, these boats can squeeze into the tight river spaces that larger ships cannot, equating to a truly all encompassing experience. Money wise, this isn’t as budget-conscious as Contiki, but you are getting an all-inclusive five-star experience for a fraction of what it typically costs. Bon voyage, my friends! If you found yourself saying “YES SIGN ME UP NOW” to any of these or want to know what else is out there (just the whole of our planet, really), shoot me a line (contact info below)! Our guest blogger, Hillary Taylor, is a luxury travel designer and advisor based in Dallas. She is part of The Simple Sol team (www.thesimplesol.com) in Dallas, an affiliate of SmartFlyer (www.smartflyer.com, a leading agency of independent advisors) and a member of Virtuoso (www.virtuoso.com). She designs highly curated and personalized luxury travel experiences for clients of all kinds to places all over the world. Most recently she has traveled to Portugal and Morocco, and next up on the schedule is Northern California. Interested in learning more? Contact her at hillary@thesimplesol.com and follow along on Instagram (@the_foreignanddomestic). Welcome Tessa Alexander to the TEC Staff! We at The Educator Collective are thrilled to announce the addition of the newest member of our staff! Tessa Alexander has been hired as TEC’s Director of Operations, effective April 1, 2018. Tessa brings a depth of experience in Dallas ISD schools to the table, having spent the past 5 years as the community liaison at Edward H. Cary Middle School. In addition to her on-the-ground work experience, Tessa is also equipped with the kind of passion, skill, and character that we believe will help make TEC a better resource for the educators it serves. On top of that she has a wonderful family - she is married to Kevin and in September they welcomed their baby girl, Lyla, into the world! We are honored and humbled to have Tessa on board! At this point, however, we would be deeply remiss if we did not thank Kate Benson, our outgoing Director of Operations, for her leadership and hard work over the past year. Kate was our first ever hire, and any success TEC has experienced in this first year of existence is largely thanks to her effort and commitment. We will miss Kate dearly, but we’re also eager to see her thrive in the next phase of her journey as she heads off to grad school. Thank you, Kate, and best of luck! Moving forward, Tessa will be the primary point of contact for all TEC members. Please do not hesitate to reach out to her directly (tessa@educatorcollective.org) with any questions, requests, suggestions, etc. Our lines of communication are ALWAYS open. My hope is that you all will get to know Tessa in the months ahead so that she, and the rest of TEC, will know how we can serve you better. As an unofficial introduction, please read on for a letter from Tessa as she looks forward to beginning her time with TEC. 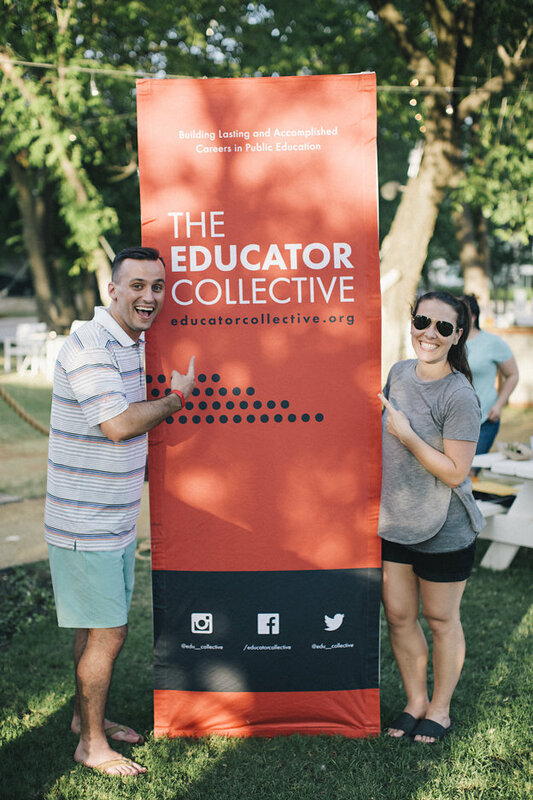 I could not be more excited to be working for the Educator Collective! This organization holds a special place in my heart as I had the privilege of partnering with Robert and Austin during their initial work in the founding stages of TEC. As a community liaison at Cary Middle School at the time, I felt so encouraged to have an organization that existed specifically to rally around and support our teachers. I have always frankly been intimidated by the classroom. I have been an ESL “teacher" twice a week to parents, a cooking club “teacher” in the after school program and a summer school Spanish “teacher” at a private school for 6 weeks. To put “teacher” on my resume though, would be unfair. I have not put in the extra hours that you have dedicated to lesson planning, copy making, attending your students’ band concerts and football games, staying late to tutor or making sure a student got home safely. You are on the front lines doing the most important and most thankless job that exists. You deserve limitless zeros added to your paycheck, yet you do this work for next to nothing because you believe in the students that fill your desks each day. I am thrilled to devote myself to finding ways for you to feel supported, rallied around, educated, and inspired. I have seen the hard work you put in firsthand and am excited to connect you to resources that will help you thrive, in turn equipping the next generation! Taylor Toynes was born and raised in the 75216 “super block” in South Oak Cliff. It’s his home, his neighborhood, and the community he has been called to serve. As a Victims Advocate in the Dallas County District Attorney’s Office, as a 4th grade teacher at W.W. Bushman Elementary School, and now as the founder and executive director of For Oak Cliff, Taylor has made an all-in commitment to empowering the people and places that make up the super block. 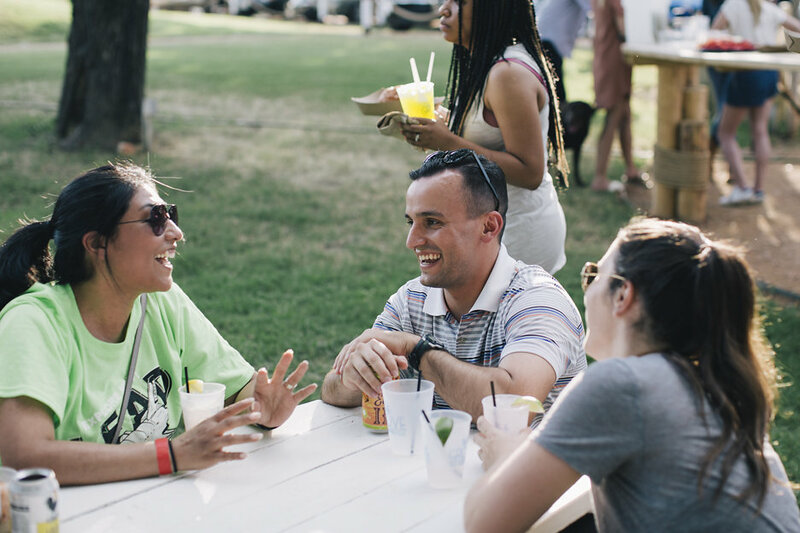 From GED classes, to civic engagement workshops, to a back to school festival in the summer, For Oak Cliff offers a holistic approach to community empowerment. 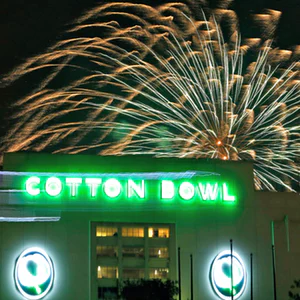 And while its scope is broad, For Oak Cliff’s impact is laser-focused. Taylor, and the men, women and children who work with him, have made the powerfully simple decision to take ownership of the community they call home. The 75216 super block is that home and they are answering the call - a call common to all of us - to ensure its flourishing. As TEC endeavors to explore the ways teachers can become advocates for their schools, students, and communities, there is perhaps no better example from which to learn than For Oak Cliff and Taylor Toynes. We count ourselves lucky to have had Taylor join us as the lead presenter at our Spring Speaker Series event on Friday, February 23rd. After hearing from Mike Koprowski (founder and executive director, Opportunity Dallas) in October, we wrapped up the 2017-2018 Speaker Series cycle with a compelling message from one of our city’s bright, young servant-leaders. We at TEC are inspired by the noble work Taylor is doing in south Dallas, and we are beyond grateful for the wisdom he was willing to share with our members, staff, and supporters at the Spring Speaker Series. We are eager to see how our members apply his advice and encouragement as they work to become advocates for the communities and schools in which they live and work. If you are a TEC member and would like to find out more about opportunities for advocacy, please contact us.